Susanna Leonard Hill: The 2013 Holiday Contest WINNERS!!! The 2013 Holiday Contest WINNERS!!! It was so nice of you all to come visit me on a non-posting day! 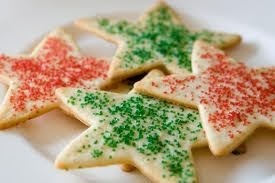 Can I offer you some non-denominational holiday cookies? And perhaps a nice cup of cocoa to go with them? Now that no one is in danger of fainting from caloric deficit, let's get right to the purpose of today's post, shall we? Normally I'd string you along for awhile and tease you with something... anything... that had nothing to do with why you're really here. But in the spirit of the holidays, I'm not going to do that today. I'm going to get right to the point. No beating around the bush today! ...as soon as we have a rousing chorus of Adeste Fidelis! There's nothing like singing in Latin is there? Want to do another verse? Okay, seriously, would you guys stop singing holiday songs so we can get down to the business at hand? Sheesh! The 3rd Annual Holiday Contest!!! As you are all aware by now, we had a record turnout for the 3rd Annual Holiday Contest - 118 entries! I was thrilled beyond measure to see so many wonderful stories! But with large entry numbers come hard choices. My assistant judges and I worked hard to winnow the total down to a manageable number of finalists that we felt were truly all-around deserving of that distinction, and those were the ones we presented to you on Monday for your vote. There were, however, many other entries that were outstanding in certain areas even though they might not have qualified all-around for one reason or another. The announcement of the WINNERS OF THE 2013 HOLIDAY CONTEST as voted on by you!!! for 'Twas The Night Baafore Christmas!!! Congratulations, Kristen!! You get first choice of the prizes that are left after Dawn makes her choice. Congratulations, Laura! You get first choice of the prizes that are left after Dawn and Kristen choose theirs. Congratulations, Heather! You get to pick after Dawn, Kristen and Laura. Congratulations, Cecilia! You get to pick after Dawn, Kristen, Laura and Heather. Deborah Holt Williams for Seriously Santa? and Angela Pena Dahle for Three Little Kings! All the winners should email me at susanna[at]susannahill[dot]com with the subject heading Prize Winner so we can work out details for you to receive your prizes! Finalists who did not finish in the top 6 (Deborah, Angela, Cheryl, Patty, Marcie, Penny, Michelle Barnes, and Carrie) may also contact me for their choice of the Kindle or paperback prizes listed above. Thank you to everyone who helped make this contest SO MUCH FUN, whether by writing an entry, reading people's stories, leaving comments for the authors, and/or voting in the finals. It's because of all of you that this contest was such a success, so many, many thanks from the bottom of my heart! So now, I want to wish you all a happy and healthy holiday filled with love, laughter, joy, and family, and a happy, healthy and successful new year! It is a pleasure and a privilege to get to spend time with you all, and I'm happy and grateful to know each and every one of you! Looking forward to all the things we'll do in 2014! lol, Susanna, you're so funny. I love reading the build-up to your announcements. :-) Congratulations to all the Final winners!!! And congratulations to the award recognition winners, too! There were so many great stories. And thank you so much for the gift, Susanna! Decisions, decisions. :-) I hope you have a wonderful, relaxing holiday break. Merry Christmas, Everyone! Congrats everyone! And have a wonderful Christmas Susanna! Thanks for creating even more fun for the holidays! Wow, what a fabulous contest! Congrats to all the winners, and kudos to you, Susanna, for putting it all together -- you're amazing!! Happiest holidays to you and your family, my friend! Congratulations to Dawn for being #1 with an entry that is adorably fun! And congratulations to Kristen, Laura, Heather, Cecilia, and Ann for being in the top 6! And congratulations to the rest of the winners and to the honorable mentions and to all entrants for writing a holiday story! Thanks!!!!! (that's not enough exclamation points) to Susanna for hosting and to all her assistants for assisting! This has been all kinds of holiday fun! Congratulations to all the winners and placers! what a wonderfully fun contest! Congratulations to all the winners, and what a great contest, Susanna! Thank you to you and your assistant judges. My kids loved hearing the stories and my son also voted for Dawn's as his favorite. I think she has something really special there. Congratulations to all! And the honorable mentions. STILL READING! good grief I'm slow (or maybe savoring). Making note of the dates! Congratulations, everyone! It was fun to read all your entries and see all your creativity at work. Congrats to all the winners! I has so much fun reading all the stories! Merry Christmas Susanna! The contest was fun, fun, fun and I really enjoyed reading all of the entries. Congratulations to the winners, do a happy dance and shout it from the rooftops (but try to stay off the rooftops while you're doing your happy dance)! Susanna, time to relax and enjoy your family. See you again in January! Congratulations to the winners and to all the honorably mentioned! WOOHOO YOU ALL!!! The contest was great fun, and I still can't imagine how you and your elves were able to winnow down that HUGE number of entries. WOOHOO YOU, TOO!!! Susanna, you are a joy and a wonder (appropriate for the season!) Have a wonderful holiday hiatus -- you deserve it. It doesn't sound restful, but it sounds wonderful. See you in the New Year! Happy Blogging Break Susanna!!!!!!!! Congratulations Dawn Young!!!! Congratulations to all of the other winners--to all 118 entries. Wishing all a joyful holiday season with No MISHAPS. Congratulations to the big winners and to all of those sparkly honorable mentions! The biggest congratulations AND thank you has to go to Susanna, though-- for bringing out the jolly in all of us. It was terrific fun! Enjoy your time off with family, Susanna-- Santa agrees that you deserve a nice rest for Christmas! Thank you, Susanna, for your wonderful contests! And thank you to all the writers for such entertaining stories! I am looking forward to the next writing opportunity! Congratulations to all of the winners! All of the entries really were terrific. Wishing you a wonderful Christmas, Susanna, and a very happy new year!! Congratulations, everybody! To the winners, and to all who participated. There is a whole lot o' talent on this blog. Thanks also to Susanna and her assistants, for running the whole shebang! Happy Holidays! Go forth, write kidlit and eat! Congratulations to all those named here! Way to go! Thank you Susanna for such an amazing contest! So much talent in one place! Reading all these wonderful stories was so much fun, and reading all the comments here, the comments left on my blog and other blogs throughout the contest has been so inspiring and rewarding. Thank you everyone. Happy Holidays! Such a wonderful job done with this contests. Where I enter or not, I love seeing all the creativity poured into the different stories and the great prizes received!! YAY to everyone!!! Congratulations to all of the winners and to Susanna and team for all of their hard work! Merry Christmas to all and to all a good night! Congratulations to all the winners, and to all the writers (winner too!) and to you, Susanna and helpers, for all your hard work! Happy Holidays, everyone! Susanna, you're a hoot! The beginning of this blog is so funny! Who doesn't like singing in Latin. Honestly, I've never heard of this song. :D Congratulations to all the WINNERS!! By that I mean those who won prizes, were mentioned for best of...,and to all participants. You've done it again, Susanna! Not quite sure how but what a success! You're the best for acknowledging everyone. Hmmmm....thinking of a Best Of Award for you! Well done y'all and Happy Holidays especially Susanna, who deserves a lovely break with the family! Congratulations to all of the winners...and to all of the participants! Contests like this one uncover a plethora of talent and bring together a group of incredible kid lit writers. A big thank you to all of the judges and prize donors...and especially to our own Susanna, who works tirelessly for our benefit. Susanna...please enjoy a much deserved break-from-blogging...and may you all have a Merry Christmas and a Happy New Year! A hearty WOO to all the entrants! An amazing contest as usual, Susanna. Merry Christmas! Thank you so much, Joanna! Merry Christmas and Happy New Year to you! It's the Latin version of O Come All Ye Faithful - we had to learn it in grade school :) I know all the verses in Latin, but only 1 or 2 in English :) As for the success, it comes from generous people donating great prizes and talented writers joining in the fun. We are lucky to be part of this amazing community! Merry Christmas and Happy New Year, Pam! Oh, I LOVE that! Anything that can be set on fire for dessert is tons of fun. And now that you mention it, I remember having something at my grandmother's at Christmas that was set on fire... my uncle always did the honors... maybe with brandy? Or rum? I'll have to ask my mom! Merry Christmas and Happy New Year, Patty! So glad to have met you through this contest! What better way to while away a few hours when it's freezing outside than to read a bunch of fantastic stories by a bunch of creative and talented writers? And all for free! 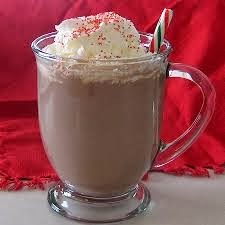 You just have to supply the accompanying hot cocoa :) Merry Christmas and Happy New Year to you and yours, Miranda! What an excellent motto! I may adopt that and spread it around! :) Happy Holidays to you and yours, Stacy! Thank you, Michelle - you're very kind! It is my pleasure to run these contests - everyone is so talented and I have so much fun reading all the wonderful stories! Merry Christmas and Happy New Year! Thank you so much, Kim! I will try to relax... I'm not that good at it :) - not with all the family home :) - but I'm really going to try to have time to read a book for fun! Merry Christmas and Happy New Year! Thanks, Kristen! Happy Holidays to you too! It was my pleasure, Michelle! I thoroughly enjoyed it! Congratulations again on a wonderful story. Merry Christmas and Happy New Year! They're an amazing and talented bunch, aren't they Sandy? So glad you enjoyed the stories! I am partial to any story that involves counting sheep - I believe it's evidence of genius :) Congratulations to you too on a wonderful story! Merry Christmas and Happy New Year! Oh, so glad Sue! Give yourself a few pats on the back for a terrific story, too! Maybe try some of those blue latkes :) Happy Holidays! I'm so glad you enjoyed it Kenda! I am always blown away by the quality of the entries... which seems to get better and better with every contest! Happy Holidays! Thank you for your enthusiasm, Penny, and for being such a whole-hearted participant in every aspect of the contest! Happy Holidays! Thanks for the kind words, Linda! I'm glad you enjoyed the contest. And Happy, Happy Holidays to you and yours as well! Aw, thanks Kirsti! But I just provide the platform - it's really all of you taking the time to write, read, comment, vote, and encourage each other that make the contest so much fun! Happy Holidays! Of course you can sing in Latin, Erik. I would expect nothing less from you :) I know more verses of this song in Latin than I do in English, because we had to learn the Latin version in grade school :) Congratulations on a truly fabulous entry! I'll look forward to that email :) Happy Holidays! I thought it was very entertaining! As Pamela pointed out, I was so impressed with the Latin. :-) Thank you for the very kind words. Have a wonderful Christmas, Susanna, and a much-deserved holiday break! Congratulations to all the writers and to the Hostess with the Mostess, Susanna! What an awesome compilation of creativity! Thank you for my Twisted Ending honor - much appreciated! Wishing you all a very Merry Christmas, Happy New Year, and joyous non-specific holiday celebrations with family and friends. Congratulations to all of the winners and to all who submitted entries to make this the biggest contest to date! And a special thank you to Susanna for all of the hours and weeks you put into this contest. And thank you for my Quiet Story honor. Have a wonderful holiday with you family! Congratulations, Pat! And thank you for the holiday wishes - I'm very much looking forward to it :) Merry Christmas and Happy New Year to you and yours! 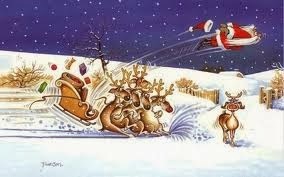 Congratulation and Merry Christmas to everyone...especially you Susanna! Congratulations to all the winners! And a very Merry Christmas and Happy New Year to you and your family, Susanna! Merry Christmas and Happy New year, Susanna. I think you have one of the most entertaining blogs in kid lit. Wow! That's a lot of winners. Congrats to all!! Thank you, Sue! That makes my day! Hope your holiday was lovely, and Happy New Year! Thank you so much, Pat! And to you too! Thanks, Kimberley! :) To you too! The 2013 Holiday Contest - Judging In Progress! Rhyme Clinic With Linda Ashman!